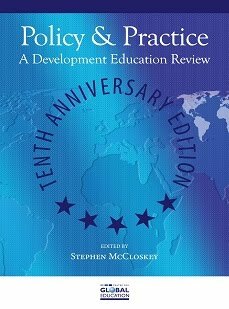 Policy and Practice: A Development Education Review is the flagship publication of the Centre for Global Education and the only journal on global education published in the island of Ireland. It features contributions from practitioners in a range of education settings based in Ireland, Britain, across Europe, North America and thedeveloping world. It is in its seventh year of operation, and is available as an open-access online publication to increase accessibility and global reach. It aims to widen the global education sector’s understanding of the delivery and effectiveness of development education at local and international levels. Policy and Practice is published bi-annually, and aims to provide a space for practitioners to critically reflect on their practice and discuss the main challenges faced by practitioners such as funding, evaluation and monitoring practice. The journal features in-depth contributions on aspects of global education practice such as research, methodologies, monitoring and evaluation, the production of resources, enhancing organisational capacity, strategic interventions in education, and sectoral practice. The journal aims to share research findings, update academics and practitioners on policy developments, celebrate and promote existing good practice in global education, inform the work of practitioners in development education and related adjectival education organisations, and to promote global education within the statutory education sector in Ireland. To join the mailing list, please click here and fill in the contact form. Each issue of the journal has a theme which is addressed by three to four peer reviewed articles (Focus section). There are also a variety of regular sections in each journal, including shorter articles (Perspectives), discussion features (Viewpoints), and resource reviews (Reviews). The journal’s designated web site is developmenteducationreview.com. The site has an archive of previous articles and profiles the current issue. It is an excellent resource for educators interested in, or researching, global education and its related areas of activity.